The author wishes to thank the organizer of this course, David Steigmann, for his invitation to contribute to this course. The other lecturers are also acknowledged for the nice and extended discussions that allowed for exchange of ideas on the topic of this course. The author is extremely grateful to Giuseppe Zurlo (National University of Galway, Ireland), formerly his Ph.D. student, for the very extensive discussions and long-standing collaboration from his early days in 2002. His key contribution to this research has had huge impact in its assessment and development. Timothy J. Healey (Cornell University) and Roberto Paroni (University of Sassari, Italy) also gratefully acknowledged for the very extended discussions on the early stages of the 2008 work. 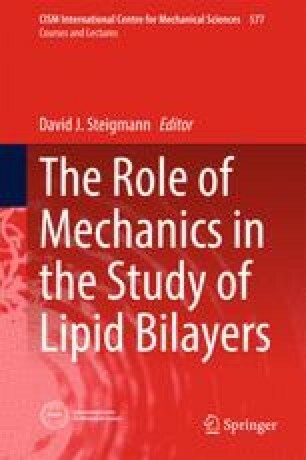 Grateful acknowledgements go to Massimiliano Zingales (University of Palermo), Kaushik Dayal (Carnegie Mellon University) as collaborators on key aspects related to the hereditary response of lipid bilayers. Massimiliano Fraldi (University of Napoli-Federico II) is also gratefully ackowledged for his illuminating remarks and insights on biological tissues and biomechanics, as well as Valentina Piccolo (University of Trento), a graduate student working with myself and other people on various topics, who also provided new perspectives on the applications of Fractional Analysis to lipid membranes and helped a lot to edit this work. The author is grateful to the financial support provided by (i) the NSF Grant no.DMS-0635983 of the Center for Nonlinear Analysis, Carnegie Mellon University, (ii) for the direct financial support of the Dept. of Mechanical Engineering and Materials Science-MEMS of the University of Pittsburgh for, and also to (iii) the support of the EU Grant “INSTABILITIES” ERC-2013-ADG Instabilities and nonlocal multiscale modelling of materials held by Prof. Davide Bigoni from the University of Trento.